One thing is certain: working from home exposes you to a multitude of potential distractions. We’re willing to bet that the moment you sit down to work on a project, your mind wanders to the housework that has been neglected, the plants that are in dire need of water and all those, yet to be conquered, Candy Crush levels! To guarantee an efficient and inspiring work space, here are a few things to consider from the get-go. If the space is for you, then it’s easy: visualize your happy place, try to recreate it in your home and make your workspace synonymous with well-being. Dreaming of an endless summer vacation? Why not opt for beach décor? Keep in mind your weaknesses; you know yourself better than anyone, so choose an area that is as far from potential distractions as possible. If the space is to be dedicated to homework, be sure to include your child in the process. Let your him or her personalize the space, if this motivates homework time, then it’s more than worth it! A chalkboard wall or giant corkboard is an excellent way for your child to add a distinctive touch to the space. Go figure… the kitchen table is not the best choice for a home office. When deciding where to set up your space, opt for a location that allows you to get away from the hustle and bustle of the shared areas. For a child’s workspace, be sure to keep maturity level in mind. An elementary school child will need your help so a shared area close to you is preferable. If your child is older, his or her bedroom will likely offer the ideal calm and pleasant setting. In a perfect world, an entire room would be dedicated to the office. For this reason, when choosing a home, it may be clever to consider an additional bedroom for your home office, especially if your job enables you to work from home. In fact, two or more-bedroom units are still available at Alcôve sur le Woonerf, in Montréal’s Sud-Ouest borough… Worth a look! If you cannot dedicate an entire room to your home office, think of all the unused areas in your home. An alcove or an empty closet may provide just the peace you need. Besides optimising the use of space, this solution allows you to isolate your office in a quiet little area. Sceptic? Let the pictures convince you! A well-lit place can greatly influence your attitude and motivation. All in all, your workspace should offer three forms of lighting: natural, ambient and task. When working from home during the day, natural lighting is key. Ambient lighting, from a ceiling or floor lamp, offers general lighting. Task lighting, from a desk lamp, directly illuminates your workspace. Tip from the pros: the desk lamp should be on your left if you are right-handed and on your right if you are left-handed; this eliminates shadows on your work when writing. Depending on the location of your workspace, natural lighting can be blinding. To adjust the light while adding a decorative touch to your workspace consider installing blinds. 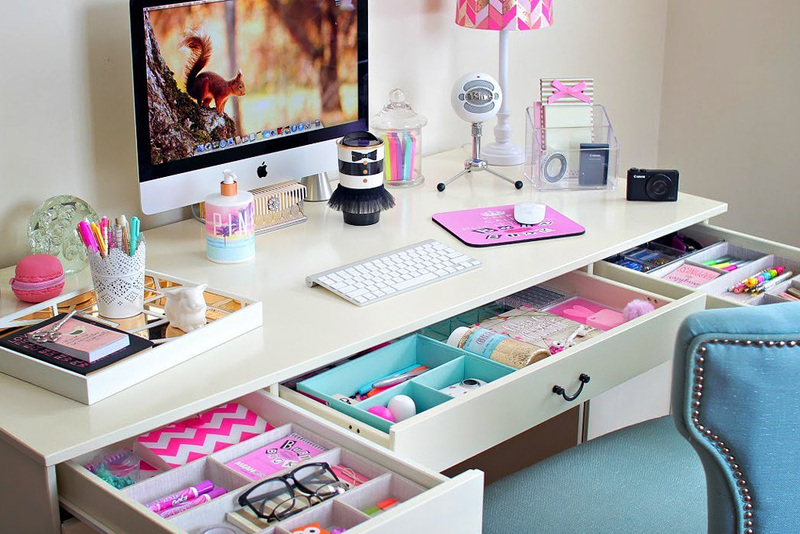 Our last tip covers storage: a well-organized workstation is a productive workstation. Make sure your desk is clutter-free. 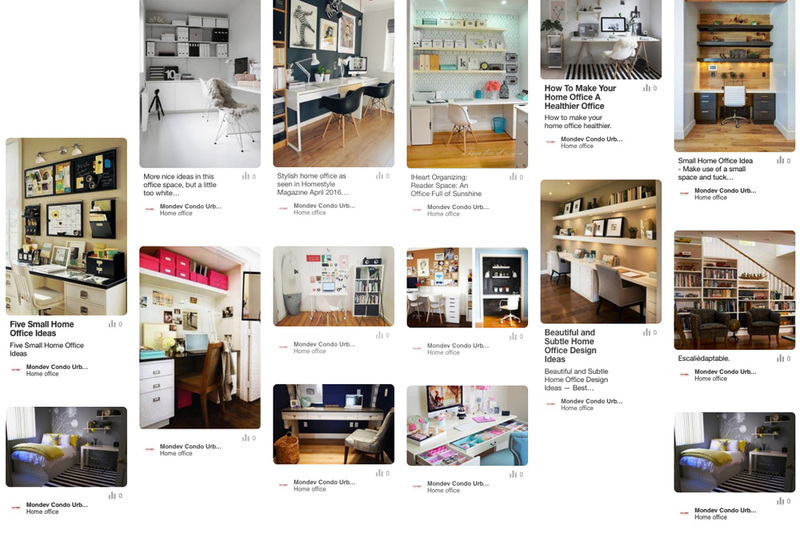 Every office supply should have a home, whether it’s a mason jar, a milk crate or a designated drawer; to achieve this, get inspired by the multitude of ideas on Pinterest. Some are even pinned on our wall. You’ll quickly realize that it’s easy to get organized with items you already have at home. 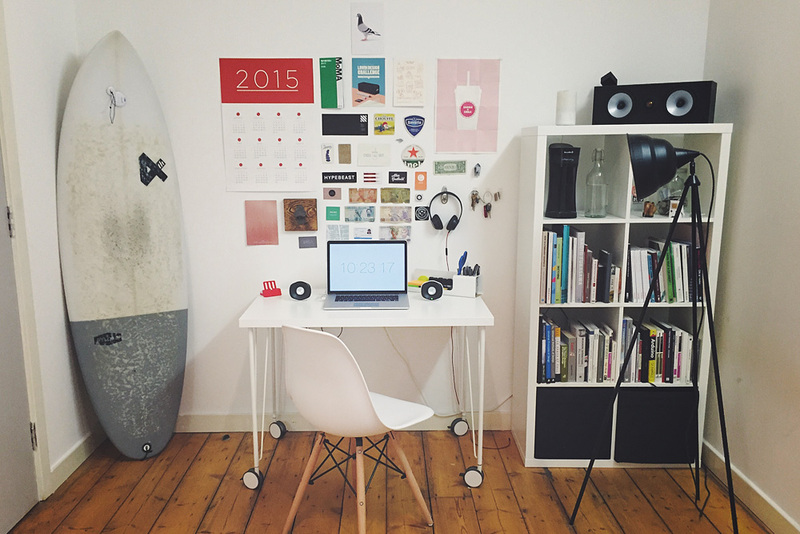 And, original storage ideas often turn out to be wonderful decorative additions to your home office.